When I was a young girl bath crystals (above) and bath beads (below) were popular birthday party gifts. 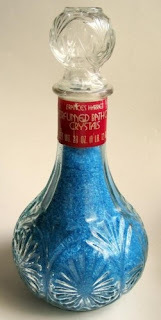 Bath crystals came in pretty glass containers - often with a stopper that reminded me of Jeannie's bottle on I Dream of Jeannie. Bath beads were about the size of marbles, and they were filled with scented oil that made the bath tub slippery! They were very pretty, though. Ironically, as an adult I use only unscented, sensitive skin products and prefer natural if at all possible ... but I still have fond memories of these bath products from my childhood years. Do you remember these bath products or other similar products from retro years? I'd love to hear from you in the comments, below. I remember we always got the oil ones for Christmas and slid all over the bath tub. 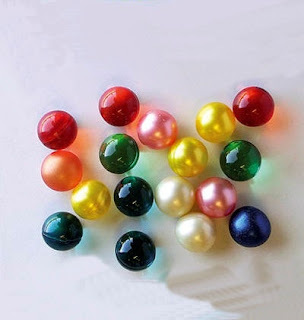 i remember these bath beads. if remember right the the ones in the picture left the water in the bathtub with a rainbow of colors! can these kind of beads be purchased stiil?